Hydrogen, the simplest and most abundant element on Earth, is a promising energy carrier for emerging clean energy technology. Hydrogen is the energy carrier that powers fuel cells in electric cars, and can be used to store energy generated by renewable sources at times of low demand. A major challenge with hydrogen energy is meeting the dual goals of high storage density and efficient kinetics for hydrogen release when it is needed. Scientists at the University of California, Santa Barbara, have shed new light on the kinetics of hydrogen release, or dehydrogenation, from aluminum hydride (AlH3), a material that is highly promising for energy storage. Their computer simulations also illuminate the basic mechanisms governing these chemical reactions in general. "Aluminum hydride turns out to be promising because the binding energy for hydrogen is low, so that the release rate can be fast," explained Chris Van de Walle, a professor in the Materials Department and head of the Computational Materials group at UCSB. "At the same time, kinetic barriers are high enough to prevent the hydrogen release rate from being too fast." Drs. Lars Ismer and Anderson Janotti in the Computational Materials group used computer simulations to investigate the microscopic mechanisms that drive hydrogen release from aluminum hydride. They performed cutting-edge, first-principles calculations to examine how individual hydrogen atoms diffuse through the aluminum hydride  a process they found to be enabled by the creation of hydrogen vacancies. Their findings were detailed in a paper "Dehydrogenation of AlH3 via the Vacancy Clustering Mechanism" published in The Journal of Physical Chemistry. Hydrogen vacancies are defects that play an important role  they enable diffusion. If every atom is in place, none of the atoms would be able to move. If a hydrogen atom is missing, a neighboring hydrogen atom can jump into that vacancy, thus enabling motion of hydrogen through the material. The group then extracted key parameters from these highly sophisticated calculations, and used them in Kinetic Monte Carlo simulations aimed at modeling how hydrogen is released, leaving clusters of aluminum atoms behind. "This multi-scale approach allows us to take the highly accurate information obtained in the first-principles computations and employ it to model realistic system sizes and time scales," said Ismer. "We can monitor the nucleation and growth of the aluminum phase and the rate at which hydrogen is released." An important feature of the simulations is that they allowed the researchers to identify the rate-limiting mechanism, which turned out to be the diffusion process. This result initially seemed to contradict conclusions from studies using the traditional interpretation of the observed S-shaped onset of the dehydrogenation curves, which ruled out diffusion as the rate-limiting factor. However, the UCSB team's simulations produced reaction curves in agreement with the measurements, while clearly indicating that the reaction is limited by diffusion of point defects. "These concepts transcend the specific application to hydrogen-storage materials," said Van de Walle. "The broader lesson here is that caution should be exercised in drawing conclusions based solely on the shape of reaction curves. Those simple rules of thumb were developed back in the 1930s, when experiments were less sophisticated and computational studies were unheard of. Our present work strongly suggests that traditional assumptions based on the shape of reaction curves should be reexamined." 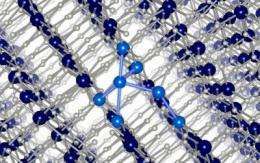 On the way to hydrogen storage? consider as well, are you talking Mols or mass?